Honda's famous CRF250R and CRF450R will be bigger and better than ever before with the evolution of a new 2016 model. To celebrate the launch of the ground-breaking 2015 CRF250R and CRF450R\* this month, Honda has announced a limited finance offer for the famed models. 13/06/14 - Driven by the experience gained from its global competition program, Honda has revised its CRF250R and CRF450R motocross racers for 2015. 09 September 2013 - When Honda's 2014 motocross models race into town they will impress riders not only with their championship-winning credentials, but also with their hotter than hot Ready to Ride™ prices. 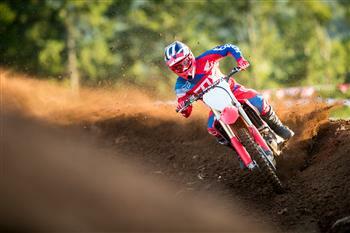 30 August 2013 - Honda is excited to pre-empt the arrival of the new CRF450R and CRF250R with the announcement that the 2014 motocross range will be released with competitive, all inclusive Ready to Ride™ prices. 16 July 2013 - Class-leading handling, improved power and trimmed weight define Honda's 2014 CRF250R which will make its way to Australia in September 2013. 30 May 2012 - Understanding the never-ending need to push designs forward to stay competitive, Honda announces the 2013 CRF250R. Honda announces the release of the 2012 CRF250R which, with a revamped engine and revised suspension settings has just reached Honda Dealerships nationally. Honda has once again improved on two of their most successful motocross machines on the market, releasing the 2011 model CRF450R and its smaller derivative, the CRF250R. Honda's CRF-R range of motocross machines now come with a hard to resist bonus, making it a great time to go racing. 13 July 2009 - Honda's 2010 CRF250R sets a higher benchmark than ever for impressive power and class-leading handling all rolled into one competition-ready package. 1 July 2009 - Tis the season for the announcement of what the manufacturer's have in store of their new release motocross bikes, and the rumour mill has been in overdrive as to what the 2010 competition machines will offer. 18 December 2008 - Honda has released a limited edition black 2009 CRF250R, featuring fresh graphics and aggressive styling. The master of the 250 class keeps getting better, and the latest edition of the CRF250R is no exception. 9 September 2008 - A pure, race-bred heir to the all-conquering CRF450R, the CRF250R is a commanding presence on Supercross and Motocross racetracks around the world. American Honda Motor Company has announced that the stellar 2008 CRF450R and CRF250R motocross machines have both won Bike of the Year accolades from Transworld Motocross magazine. - All plastic body components (radiator shroud, sidecovers, rear fender, seat base, fuel tank, front fender and front number plate) offer a slim, aggressive style and light weight. 2018 Honda CRF250R, with a new compact DOHC engine with rocker arms, higher valve lift, larger valve diameter and a higher rev limit resulting in a +5% power-to-weight and peak power at 2000rpm higher.